Prime Minister May's Withdrawal Agreement has, so far, been rejected three times by MPs in the UK's Parliament. Who writes about Brexit anymore? It is a mug’s game: events move too fast; there’s no solid position from which to speak. Whatever will be will be; it was tempting to write that in French but that seems a bit inappropriate. 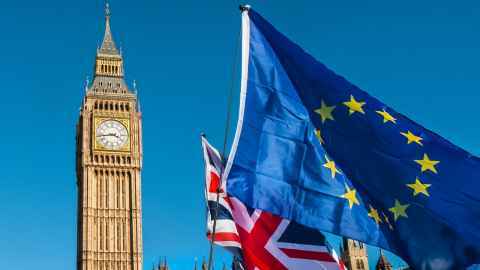 The UK was meant to leave the European Union on March 29, and now, as it stands, if no deal is agreed, will crash out on April 12. Prime Minister Theresa May has three times tried and failed to get her Withdrawal Agreement (the only deal in town, she says) accepted by Parliament. MPs have twice discussed a variety of alternatives, and have not fancied any of them. May seems to have finally recognised that her deal will not pass, and indicated a willingness to engage with the leader of the Labour Party to find a solution. At the time of writing, it is unclear what this will yield. Is it a poisoned chalice, since any failure to advance a solution would, in the eyes of a Tory press, mean that Labour was as culpable as the Conservatives, who are embroiled in a bloody civil war? Or will some sort of government of national unity emerge, as May and Corbyn (both of whom favour Brexit) pull the country back from the cliff-edge in the nick of time? Whatever happens, the country beyond Westminster is hopelessly divided. Recent polls suggest 92 percent think the government has handled Brexit badly - one wonders what is going on in the heads of the other eight percent - and attitudes have hardened. Over 1000 days since the referendum, remainers are even more convinced of the need for a ‘people’s vote’, aka a second referendum, and leavers are even more adamant that leaving without a deal is better than a soft Brexit that would maintain links with the EU. There are rival marches on Parliament, and as the UK has had its share of civil disturbances, who would bet against that happening again over the coming weeks? Maybe there will be a snap general election, but this is one that would be defined by Brexit, and could see a major realignment of the political system. The centre (left or right) cannot hold, and populism, already on the march across Europe, may emerge in movements that are virulently anti-immigration and anti-immigrant. So, again, who writes about Brexit anymore? But we must try to make sense of it. We must try to avoid simple stories. It is not a simple case of racism and the failure of large sections of the British public to come to terms with the loss of Empire. After all, it seems that one-third of black and minority ethnic voters opted to leave. It is not a psychological defect of the English who have a special fondness for self-flagellation, the argument put forward by Irish Times commentator Fintan O’Toole in his readable book Heroic Failure, or even the simple delight of the left-behind socking it to ‘the man’. I believe it’s linked in some ways to the sense that the European project has not delivered. The golden days of European prosperity are long behind us and the forthcoming European elections will see a surge of nationalist support. In 2014, against the backdrop of a financial crisis and worries over immigration, Eurosceptic, populist and far-right parties won a record 52 seats, an increase of 15 on 2009. Added to that, in Britain, the political system has severed its direct responsibility to the people and imposed almost a decade of austerity for almost no visible return, except to the rich who have been allowed to keep partying. Maybe the challenge is to stop writing about Brexit and focus our minds instead on what someone a few years back was called ‘Bankrupt Britain’ - bankrupt that is, economically, politically, socially, environmentally, and morally. This suggests that Brexit is more of a symptom than a cure, and that we need to start thinking about what a post-Brexit Britain might look like. Perhaps the size of the nation’s cake may be smaller, but it could be cut up differently and maybe new ingredients added. Hard to imagine at the moment I know, but that may be the real task ahead. Professor John Morgan is Head of Critical Studies in Education at the Faculty of Education and Social Work. He is formerly from the UK. This article reflects the opinion of the author and not necessarily the views of the University of Auckland. Used with permission from Newsroom Brexit stories out of date by lunchtime published on 5 April 2019.